One way we welcome the holidays every year is to host a gingerbread house party. It’s always on the first Saturday of December and it’s always tons of Christmas fun. It’s one of those parties that allows guests to amuse themselves so the host isn’t too busy to enjoy the party, too! 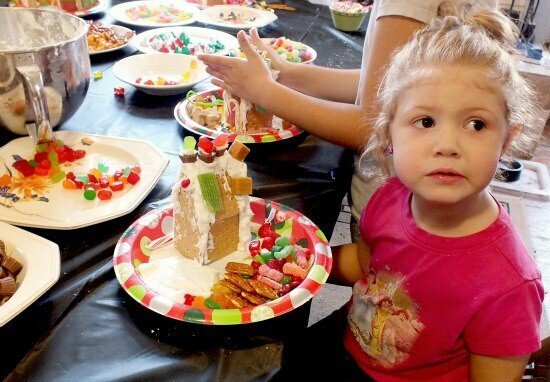 Here are some easy ways to make this holiday party fun for kids of all ages! This post has been updated from the December 2007 version. Images are from various years. 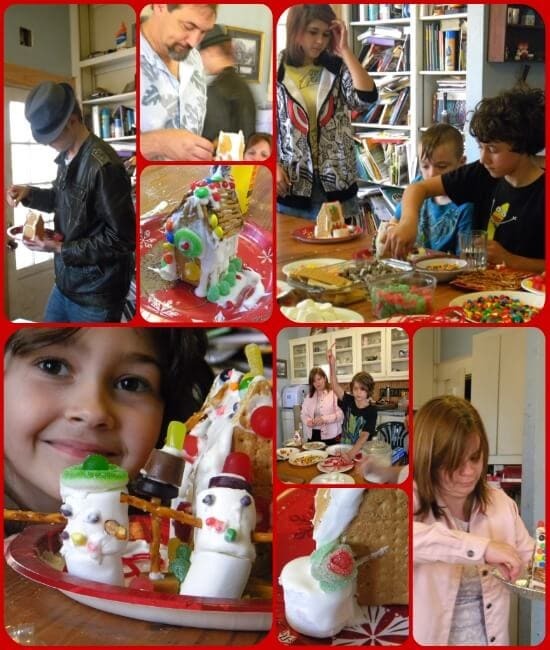 We’ve just finished with our 25th annual Gingerbread House Party. 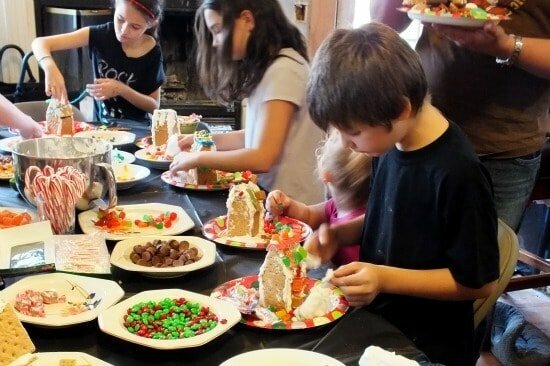 25 times I have put together gingerbread houses from graham crackers and let my kids, grandkids, and friends stick as much of that candy on the houses as they could. In the past few years I’ve taken video so that I can relieve the memories over and over – at this point we have four out of my eight kids missing the party regularly thanks to that pesky thing known as adulthood. I now see gingerbread house parties and gingerbread houses made with graham crackers all over the Internet this time of year — knowing that I posted my first gingerbread house party instructions in 2006 on blog that’s no longer in existence I can’t help but wonder if some of it stems from my idea all those years ago. We aren’t fancy. We’ve been doing this so long that people basically know to show up. When we first started out I had fewer responsibilities and more energy. I used to make gingerbread men with the guests names on them and tuck them in a plastic zipper bag with a note about time and place. 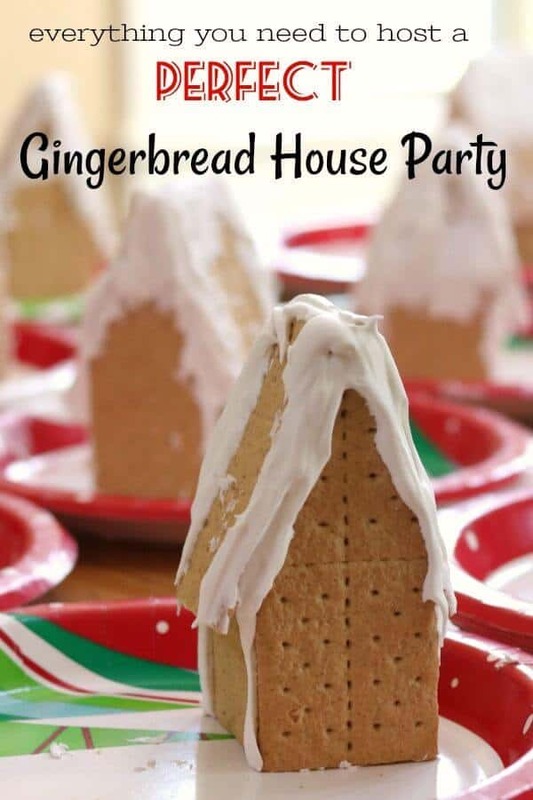 You could print gingerbread men invitations, too. 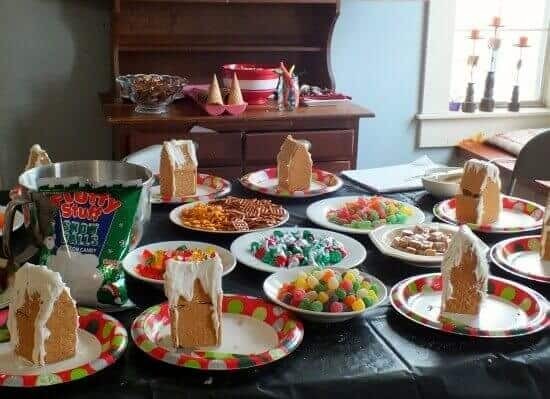 I’ve found that it’s important to make extra gingerbread houses because kids, especially younger ones, have a tendency to treat the houses as if they were made out of legos. Nearly every year someone’s house is crushed from too firm a hold or too much candy – and it’s nice to be able to hand the guest a new one. I’d say make at least 2 to 3 extra houses for every 10 guests. 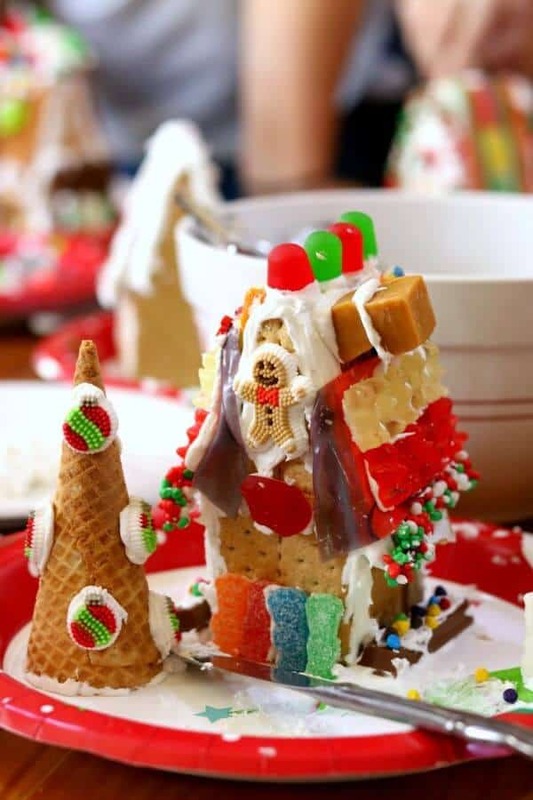 Make the gingerbread houses the night before. Place each house on a paper plate. This makes it easy for the kids to take them home AND it’s cheap and easy. If you live in a humid area make sure that you use a dehumidifier, heater, or air conditioner to keep the house dry. If there’s too much humidity the houses will soak up the moisture and begin to collapse. I used to put the royal icing in separate plastic bags for each child – this allowed me to prepare them ahead of time. When it was party time I could just snip off a corner of the bag and the kids were ready to “glue” the candy on the houses. After a couple of years I realized that they used their fingers anyway so I just started plopping down a glob of royal icing “glue” on the plate next to the house just before they were ready to start. 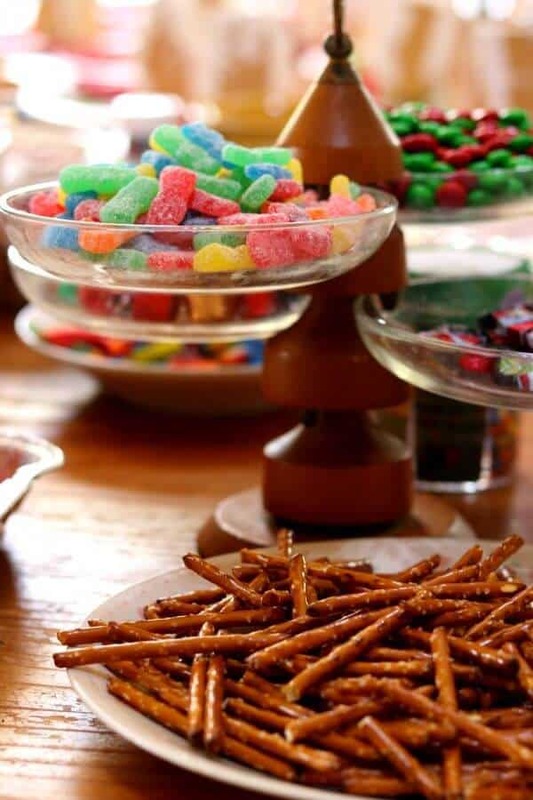 We don’t use just candy. The little pretzel sticks work really well for a log roof while vanilla wafers look like those Victorian fish scale shingles. Small wheat squares cereal looks like thatch. Nothing is too “out there” when you’re looking for possible decorations. You get the idea. Look around and see what you can find. I’ve done the refreshments aspect several ways. When I was in my mid thirties I had creativity, vision, and energy. In my late fifties I have a desire to get it over with and get into the hot tub with some wine. Life changes and we change a long with it. Nowadays I tend to be of the mind that the kids are going to get enough sugar during the party so I set out plastic cups and point them to the water faucet. I don’t serve food because experience tells me they are going to eat candy – and for this reason I do serve wine to any parents that stay. I figure it’s the least I can do since I’ve pumped their kids full of sugar and the next several hours the parents will be peeling the kids off the ceiling and chasing them around. At least until after the sugar wears off. And why is that? I mean, why does sugar make kids act like hummingbirds on amphetamines while all it does for adults is make them fat? You can keep a slow cooker full of hot water and ladle out what you need, use an electric tea pot, or microwave water on a cup by cup basis. Pass this Spiked Mexican Hot Chocolate for the adults that have been brave enough to stick around. If you want a punch I’d suggest something with a ginger ale base to it. The recipe below is one of our favorites, straight from the 1940s. You get the idea. ANYTHING that isn’t sugary. 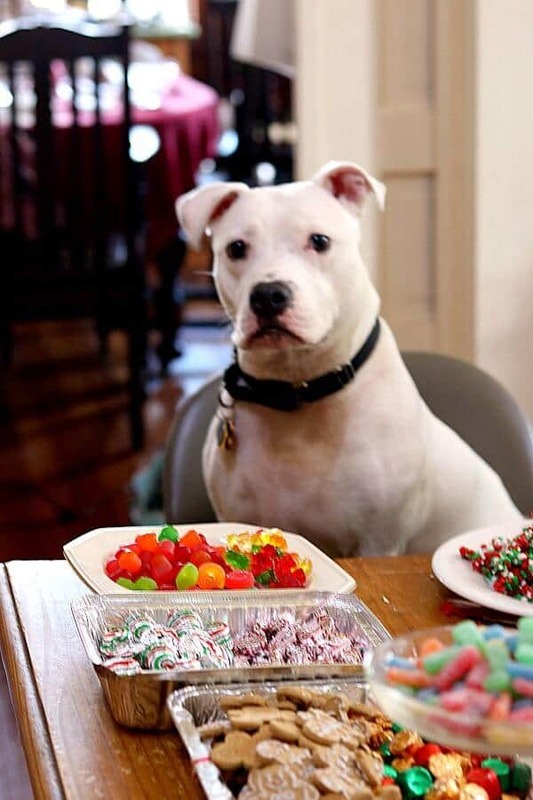 Personally I’ve always felt that the houses, the candy, and our regular Christmas decorations were enough and I don’t add anything for the party. It’s good to have a plastic table cloth that you can just gather up and throw away. Most party stores carry them in a variety of colors and you might even be able to find a Christmas patterned one. This gingerbread door cover covers your front door and gets your guests in the mood for some gingerbread fun. Decorated plates are always cute and this package has napkins to go with them. So, I don’t serve punch much anymore, at least at the gingerbread house party, but this one is SO good I wanted to include it in case you wanted something besides hot chocolate to serve. The ginger and citrus really shines! The sherbet is optional. If you like this recipe please consider giving it a 5 star rating! Full of sparkly citrus flavor. This is so pretty with orange and lemon slices floating in it! Blend the orange juice, lemon juice, and cranberry juice. Just before serving add orange sherbet to a punch bowl - it's prettiest if added in round scoops. Add the chilled juice to the punch bowl. Add the ginger ale and the orange slices. What a great idea!! That little blonde cutie is adorable. Great looking family and it looks like they’re having a lot of fun!! This is a tradition they’ll remember forever! Yeah that little blonde cutie is 8 years old now…LOL! I kept some of the old pictures when I updated.